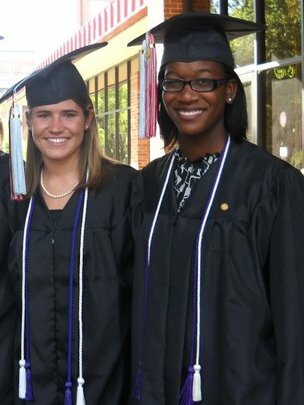 Catie and I at graduation, May 7, 2010. God is good. I mean, really good. A couple weeks ago, I received an email from this dear friend of mine, the one and only Catie Johnson. Catie and I were a part of "the awesome ladies otherwise known as Cluster F" at UGA. We spent just about every day together for two years, in which we learned, grew, prayed, laughed, dreamed, and discovered just why we wanted to be teachers anyways. Catie is a wonderful woman. She is hardworking and disciplined, and she truly cares about the people in her life. Her new home is Colorado Springs, Colorado, where she teaches kindergarten and represents Teach for America and more importantly, Jesus in a dark place. So back to the email. Catie wrote to tell me a quite amazing story that shows just how small our world is. One Sunday morning, Catie visited a new church, Rocky Mountain Calvary. Little did she know that RMC is the sending church of my pastor Sean, and his family, our Lightshine pastor, Chris, and his family, and my friend Amanda and her husband Chad. Insanity. Or God. Amanda and I on Mexican Independence Day. But wait, because it gets even better. This Sunday morning, a man stood up to talk about missions, and he specifically spoke about missions in Mexico and the Calvary Chapel that he helped to found in Chihuahua. And this man is my Bible study teacher, Chris. His wife, Heather, and I are friends, too, and their kids just started attending Colegio Binimea this year. And that Sunday, they were in Colorado to share about what God is doing in Lightshine amongst the Tarahumara people. And Catie was there to hear it all. It gets even better. Catie sought out the missions pastor, who led her to Chris and Heather. They met and talked about me and how small our world is. And the following Saturday, Catie ran in 5k race that raised money for orphans. Wow. How amazing is God? Just wait, because it gets even better. In two weeks, I am going to visit Catie! I have wanted to visit Colorado for a while now, and Texas is quite a bit closer than Georgia...so after a few phone calls I worked out rides to and from El Paso to go and visit Catie for my next school break, which is in just two weeks. And what is even more exciting is that Amanda will be there, too! She has to do some stateside business stuff, like get her last name changed, blah blah blah...so I get to spend time with Catie and meet her sweet kiddos and then do touristy things with Amanda. And Catie's family is coming up later in the week, so I will hopefully get to meet them, too. Overwhelmed right now by just how much He loves. Last night I barely slept a wink; I was so excited. And I still am...it doesn't seem real! I love the way He works. How can you not be moved?